After six weeks of travelling, it takes a while to adjust to the rhythm of cooking your own meals, let alone all those other tedious tasks, such as bed making and house cleaning. Where are those fairies who come and clean up? Home cooking routines return more quickly; after all, we do need to eat at least twice a day. After purchasing one packet of inedible bread, the sourdough starter was revived and our breads are back on the table, using a variation of this recipe. I dehydrated my sourdough starter (Celia’s method can be found here) back in July, but then discovered that one very kind sir kept my fridge dwelling starter, Sorella, alive, replenishing her each week while visiting to feed my other animals. Sourdough loaves, one for now, one for the freezer. Home made food tastes glorious, modest yet satisfying and comforting, filling that yearning for more olive oil and cheese that is missing in most Asian diets. And then there’s the wine- beautiful Australian and New Zealand wines at an affordable price. The Spring garden is neglected, with only leeks, celery and herbs ready for picking, while our hens keep pumping out eggs, now far too many for our own needs. It is with these modest supplies and a well stocked pantry of basics ( lentils, rice, pasta, dried beans, olive oil, cheese) that we can eat well for very little. A garden full of leeks. My budget dishes this week included a Flamiche, a leek based quiche, enabling me to make a dent in the leek and egg bounty. A leek and potato Vichyssoise for the export market (my mother), a lentil shepherd’s pie with Kumara mash, (my $1 per person comfort food), a salad of baked pumpkin with haloumi, the pumpkins left over from last Autumn’s harvest screaming to be used. Haloumi can be picked up in 1 kilo jars at Bas foods for around $10, another pantry/fridge essential for a quick salad. A purchase of 400 grs of Dory fish fillets was stretched over three meals: 200 gr went into a Vietnamese caramel claypot, (still trying to perfect this method of cooking), 100 gr accompanied some fresh mussels in a Pasta Marinara, and the last 100gr added more flavour to a Balinese nasi goreng ikan. Toss the pumpkin cubes in a little olive oil, season, then bake for around 20 minutes, stirring or turning over once during cooking. I often bake extra to stash in the fridge for a pumpkin risotto or a pumpkin and caramelised onion pasta or topping for a foccaccia. Cool the pumpkin. Cut the Haloumi into strips and fry in olive oil until golden on both sides. Refresh chosen salad leaves and dry. Cut the cucumber into long thin edges. Toss the leaves and cucumber in a bowl with salt flakes, a little olive oil and balsamic vinegar. Plate the leaves, cover with baked pumpkin cubes, and haloumi strips. Add ground pepper and another drizzle of oil. I became quite fond of this simple dish and ordered it often in a little Balinese Warung by the sea. My version includes some sliced fresh turmeric, as I believe all the healthy hype surrounding this little tuber, despite my general cynicism regarding supposed ‘superfoods’. The Balinese always colour their seafood nasi with red, simply using tomato ketchup from a bottle. I used some bottled tomato passata. The choice is yours- use what’s on hand. Nasi Goreng Ikan Recipe- serves 2-3.
one fish fillet (100g or so) of boneless fish, for example Dory, chopped into small 2 cm chunks. 2 small purple shallots, chopped. Heat the wok on a strong, high gas flame, add two or so dessertspoons of oil. When the oil is hot, add the aromatics- garlic, ginger, shallot, turmeric, chilli, and kaffir leaves. Stir and toss for 30 seconds. Add the fish, toss about until opaque, then add the capsicum and cabbage. Add the rice, breaking up large clumps with your hands, then stir fry the rice through the vegetables, tossing well as you go and colouring all the rice. Add the sauces, toss further, then season with pepper. A nasi goreng has a wetter, denser consistency than its Chinese cousins. Thanks Peter, from Tropical Bliss B & B, for the delivery of fresh turmeric from your northern paradise. Posted on June 23, 2016 September 22, 2016 Author FrancescaCategories Budget, Italian Culture and Cuisine, pasta, Rant and Rave, RecipesTags budget, eel, fish, local government, local politics, smoked eel, spaghetti carbonara, VCAT31 Comments on Spaghetti Carbonara: I Can’t Believe it’s not Bacon. Moeraki Surprise, Fleurs Place. New Zealand. Sometimes fate sends you a nice little surprise. We were driving along the highway heading towards Dunedin, about 40 kilometers south of Oamaru, when I noticed a sign on the road promising a bowl of seafood chowder at the local tavern of Moeraki. Moeraki, the tourist brochures informed me, is known for its boulders sitting on a beach: no mention of the nearby town or tavern. Stuff the boulders, I thought, just give me that soup. We detoured off the main route and pulled up at the Moeraki tavern only to find it well and truly closed. Chiuso. We knocked and banged a few times in the hope that someone might magically appear but it remained locked. Seats up. Lights out. I felt really cheated. My taste buds, alert and eager, now grieved as they slowly considered the inevitable exchange- a big bowl of fishy chowder was about to become a mundane home-made cheese sandwich in the back of the van. At this point, still hoping for a loaves and fishes miracle, I peered down towards the sea and noted a rather large group of cars gathered around what looked like an industrial tin shed. It was a Wednesday and around 1.30 pm- a funeral perhaps, or maybe a fishing co-op? or a party? There were no other signs of life in this deserted holiday town. We headed down a narrow one way road towards the tin shedded promontory and, lo and behold, we discovered the fabulous and very famous little restaurant, Fleur’s Place, sitting right on the edge of the sea. It was busy, mostly with young Asian travellers who were obviously in the know. I hadn’t heard about Fleurs, making the discovery all the more serendipitous. Upstairs at Fleurs Place, Moeraki, New Zealand. On entering, I felt very much at home. The wood lined interior, which utilised recycled materials, windows and staircases and lots of quirky decor, contained an upstairs mezzanine, reminding me of my old home and those of all my friends. Old hippy houses, hand-built idiosyncratic places that I have come to miss. Then I noticed the chalked sign offering freshly caught fish daily. It was a hallelujah moment. A table for two please. Fleur buys fish from the local fisherman daily. Fleurs Place, fishy metal sculpture above the bar. We chose an inside table- the last one available, although the upstairs section, with its few tables looking out to sea, was also very inviting. Fleurs Place, stairway to the mezzanine dining area. We shared a platter consisting of a generous serve of smoked eel pâté, some smoked salmon slices, a beetroot chutney, croutons and assorted gherkins and caperberries. It was very good indeed. A generous serve of chowder at Fleur’s Place. We followed this with seafood chowder. It was not the chowder of my imagining, but rather one made from a rich tomato and home- made fish stock. Studded with local clams, mussels, fish chunks and scallops, it was a generous bowl and came with plenty of bread. An empty bowl of chowder, Fleurs Place, Moeraki. There were some lovely desserts on offer, including slow poached quinces, but we were ready to hit the road again. It was only much later that I found out a little more about Fleur and her life as a chef at Oliver’s Restaurant in Clyde, Central Otago, as well as the comments by Rick Stein. I recommend this place highly although beware, most main course fish dishes are costly, around NZ $40 or so, but then the sizing is generous. Fresh fish includes blue cod, John Dory, moki, blue nose, gurnard, sole, flounder, groper, and crayfish. Regional organic growers supply most of the other ingredients, including unique New Zealand vegetable varieties and the wines come from Central Otago. and I highly recommend this fascinating interview, which includes a wonderful story about the whales visiting again. Posted on May 20, 2016 May 20, 2016 Author FrancescaCategories Restaurant Review, TravelTags East Coast, fish, Fleurs restaurant, local, local fish, Moeraki, New Zealand, new zealand clams, Restaurant Review, seafood, South Island40 Comments on Moeraki Surprise, Fleurs Place. New Zealand. Spiedini di salmone alla griglia con salmoriglio. – Grilled salmon kebabs with salmoriglio dressing. One of my most vivid memories of Palermo is its famous dressing, Salmoriglio, probably because it is so easy to recreate, especially during late Spring when the patch of oregano is at its peak. When I first tried this in a restaurant Palermo, it came drizzled over a thinly cut fillet of pesce spada, or swordfish, along with contorni, a platter of simply grilled vegetables. According to Marisa Raniolo Wilkins, in her cookbook, Sicilian Seafood Cooking, the name comes from its three main ingredients – salt (sale), lemon (limone), and oregano (origano). Pound the oregano leaves with the salt in a mortar and pestle. When it forms a paste, add the lemon juice, then the oil and grind in some black pepper. Store in a jar and see how many ways you can use it over a week. As a cold sauce, it is best applied to hot food and then smell all the elements of the ingredients come alive. 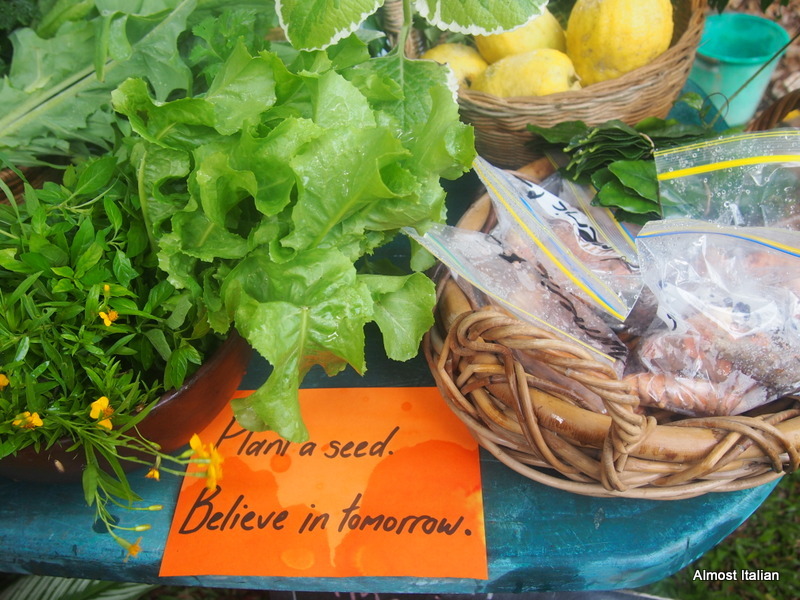 Along the coastal road through Far North Queensland, markets and roadside farm stalls provide a bounty of produce. It’s always a risk leaving a big town, with its safe supermarket and air-conditioned aisles of familiarity, to head off into the wilds in the hope of finding fresher, less uniform produce along the way. It is a risk worth taking. 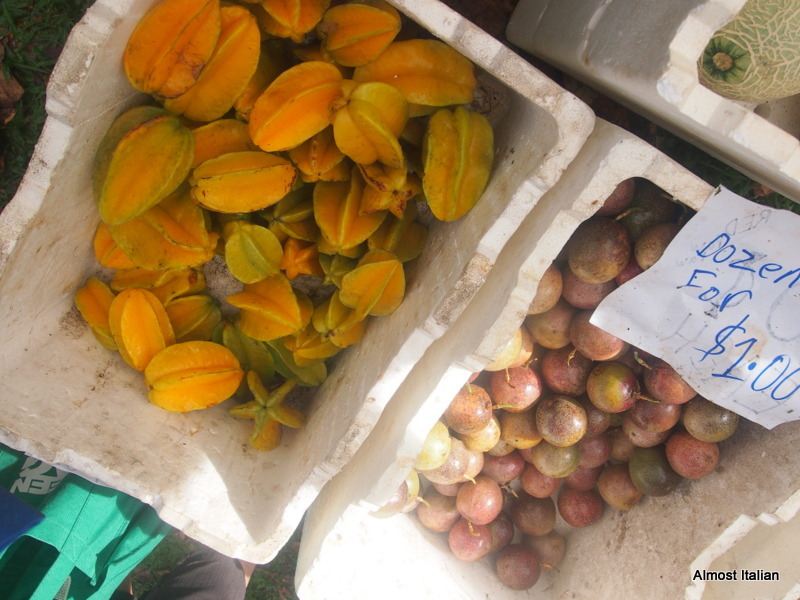 Heading north from Cairns, the main source of fresh tropical bounty is the Saturday Mossman market. North of Mossman, the supplies are minimal so time your visit well. 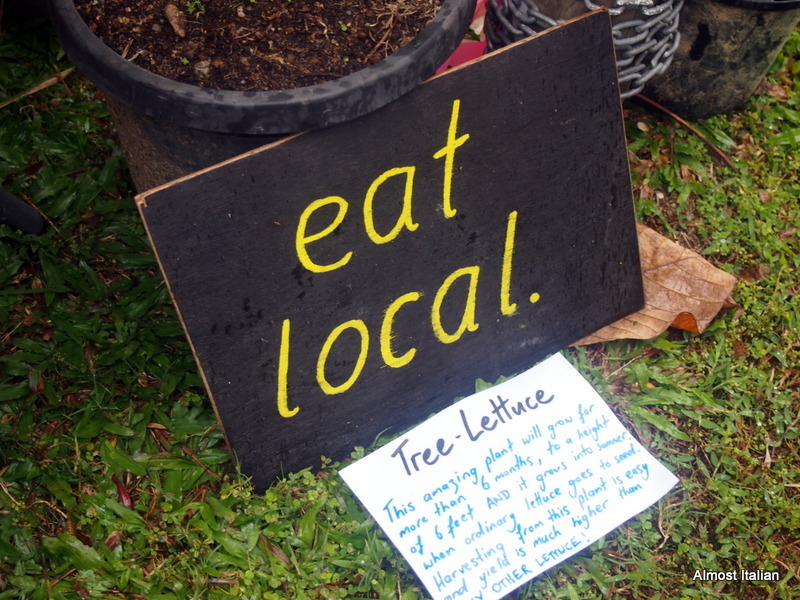 The Mossman market is an eclectic mix of old Australian of the Devonshire tea variety, new Thai farmers, old hippy and earnest organic growers. 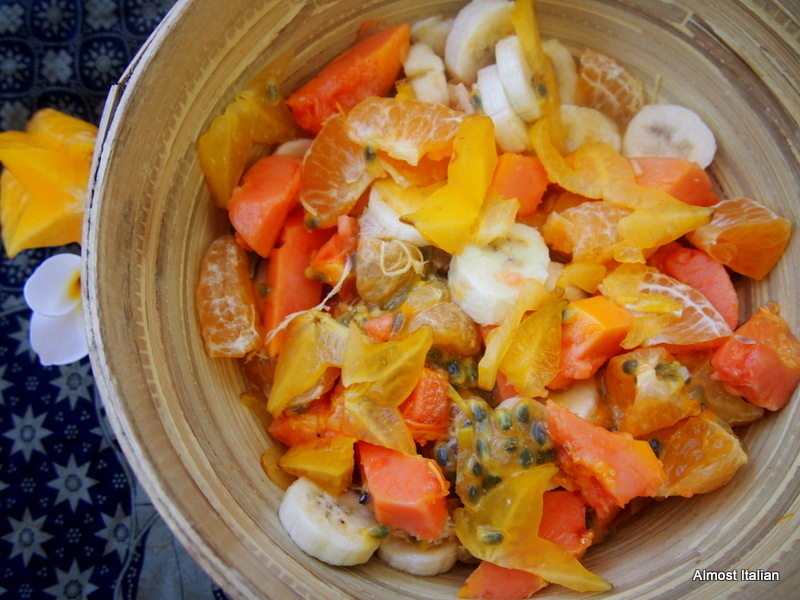 I purchased freshly crushed pineapple juice, bags of cherry tomatoes, Thai herbs and spices such as fresh stem ginger, kaffir lime leaves, and chilli as well as tropical fruits, papaya, mandarins, and large hands of lady finger bananas, the latter courteously ripening two at a time as we travel along in our camper van. Some children had a tiny stall with limes and sweet basil, and a late arrival brought along a table of freshly pulled purple shallots. Never too old to busk. 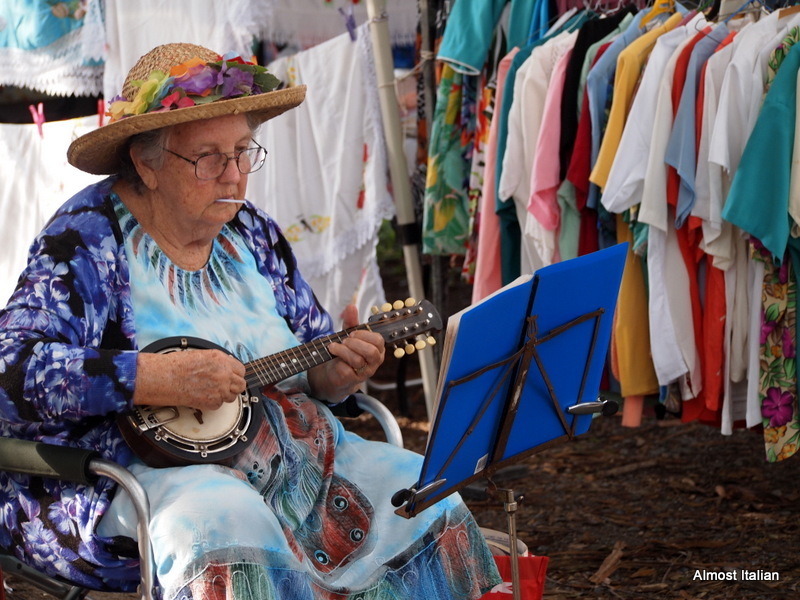 Mossman Market, Far North Queensland. 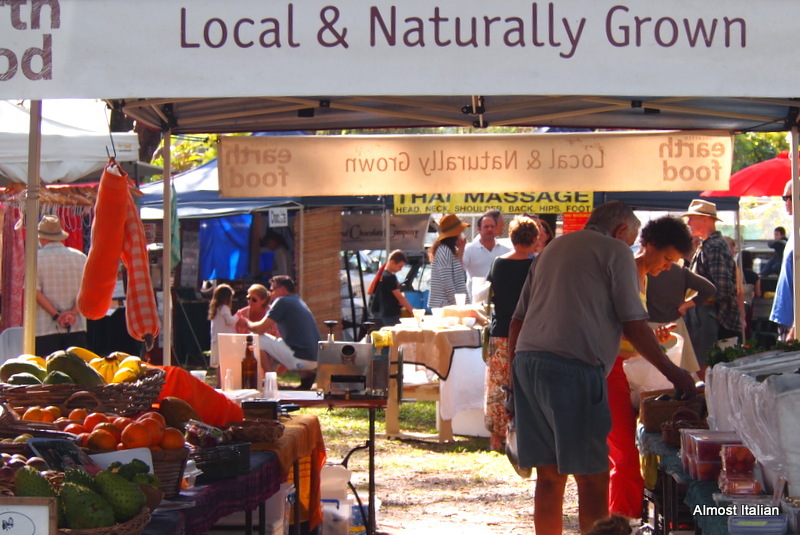 Heading south from Cairns, roadside stalls begin to appear after Innisfail, with a few farm stalls along the way to Mission Beach and mandarin stalls in the misty hills near the Tully River. 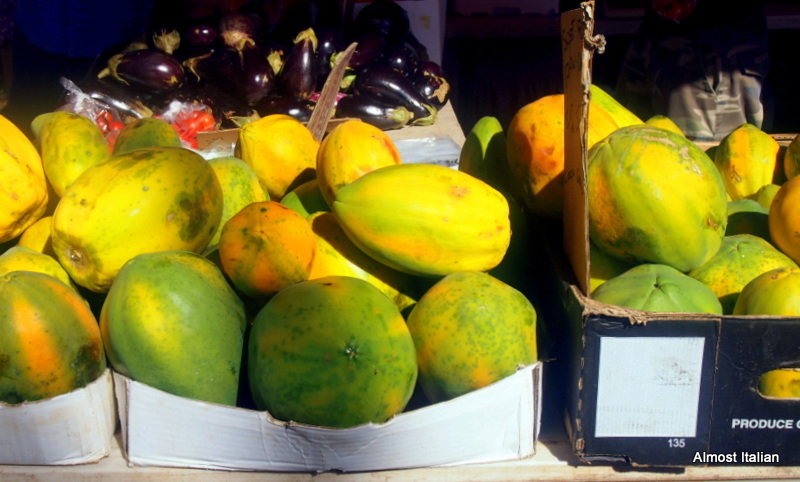 In the winter months, look for long green Thai eggplant, tomatoes, pumpkin, sweet potatoes, and chilli, as well as passionfruit, bananas, papaya, pineapple, limes, mandarin, and bags of small avocados. The fruits end up in our daily Sunshine Pine Salad, named after our dear friend Sunshine Pine from Taraxville, a girl who loves orange! 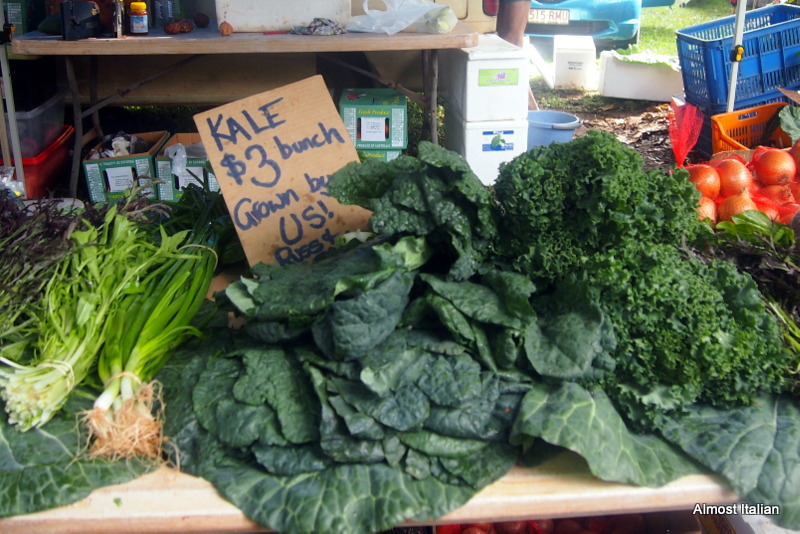 The Sunday Market at Mission beach is another excellent source of freshly grown produce. I was delighted to find a fragrant bouquet of fresh curry leaves, carambola (star fruit) and a bag of baby sweet potato. Fresh seafood is available at Cardwell. Moreton Bay bugs taste as sweet as crayfish, and the local Spangled Emperor fish has firm, white flesh, perfect for a lunchtime BBQ. This fish is caught only in the Coral Sea and is worth a trip up north just to taste it. Our road trip down the east coast of Queensland, from Cape Tribulation to Coolangatta, is a research journey as well as a holiday. While pubs and restaurants supply reasonably priced meals, most of these are deep-fried, standardised and bland. Sadly, that’s country food. With a bit of forward planning and local knowledge, it’s possible to eat extremely well along the way. Pull up in your car, grab a picnic table, and eat with a view in the warm open air. Food never tasted so good. 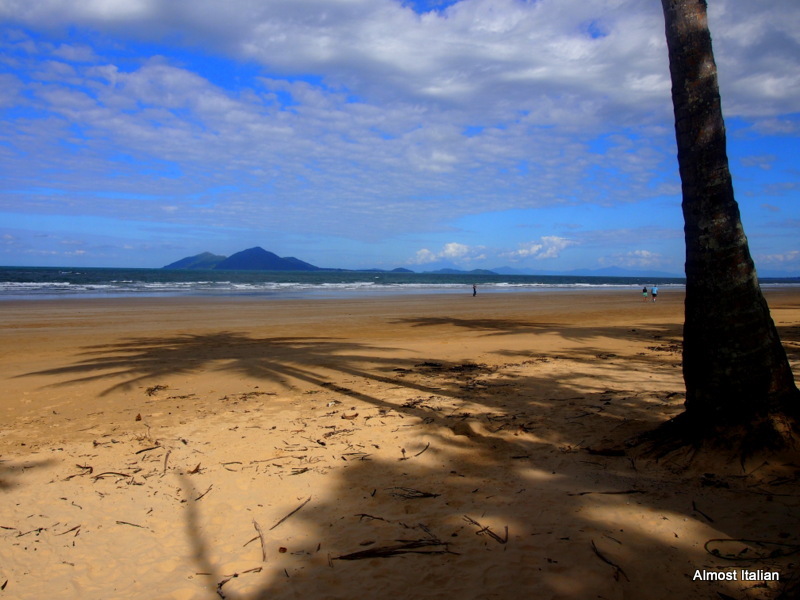 View of Dunk Island from Mission beach, Far North Queensland, Australia.